So, I watched Burnt last week and was sort of unimpressed with it but I kept seeing No Reservations float past me on the old Netflix app and I thought, why not give another food-based movie a go? So, we went old schoolish and fired it up. Catherine Zeta-Jones stars as Kate Armstrong, the head chef of a trendy New York restaurant which Wikipedia informs is called 22 Bleecker Street and is in the West Village of New York. (Neither of which is all that relevant to the film itself, but Wikipedia thinks it is important.) Kate is driven, obsessed with making the most perfect food possible and runs her kitchen at a breakneck pace. She intimidates everyone around her, including her boss (Patricia Clarkson) who sends her to therapy (with her therapist, played by Bob Balaban.) Kate hates leaving the kitchen to take compliments, but is all too ready to leave the kitchen to deal with customers who insult her cooking. All in all, she is very very good at her job, has a life she loves, all of which gets derailed her sister is killed in a car accident and her nine year old niece (Abigail Breslin) has to move in with her. Kate is devastated by her sister's death and is struggling to adjust with a nine year old in the house and to top it all off, her boss decided to hire a new sous chef, Nick (Aaron Eckhart) to help out while Kate is adjusting and getting her life back together. Nick is the polar opposite of Kate. He loves food, he loves to listen to opera, he likes making people laugh and he is the kind of rising star that Kate immediately realizes could be running his own kitchen anywhere. Nick, however, insists that he wants to work with Kate because she's the best. A strange attraction grows between the two of them despite Kate's best efforts to resist it. They both love food and Nick develops a special bond with Zoe as well. 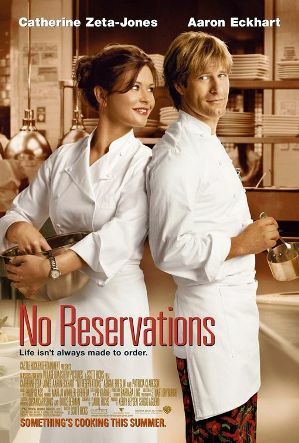 All of it gets derailed when Kate's boss offers Nick her job and Kate's pride almost ruins everything until she realizes that she needs to overcome her pride and jump into something good with... no reservations! The movie ends with Nick and Kate happily in love and running their own bistro with Zoe.